WATCH HILL, Fire Island (WABC) -- Seven people were rescued after their boat ran aground off Fire Island early Saturday morning. 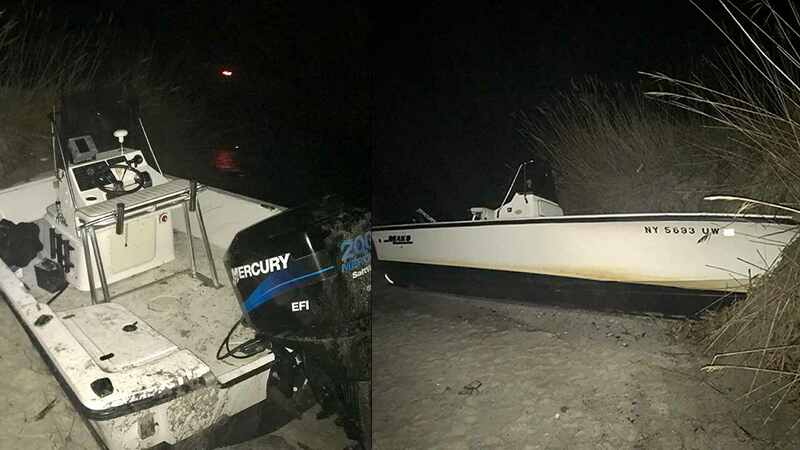 Around 12:30 a.m., a group riding in a 21-foot Mako boat were heading from Brookhaven toward Sayville when the boat ran aground and struck a sand dune 50 yards from the Watch Hill Marina on Fire Island. A family member of one of the passengers called 911. Upon arrival, police administered first aid to one passenger who had a leg injury, airlifting her to Stony Brook University Hospital. The other six people refused medical attention and were taken to Sandspit Marina in Patchogue. The Suffolk County Police Department is reminding boaters to carry a Marine VHF radio as well as a cell phone to call 911.